The retailer renounces a loan facility from its founder in a sign he cares about its reputation. Founder-CEOs aren’t unusual for public companies. You only have to look at Jeff Bezos at Amazon, Larry Page at Google/Alphabet and Mark Zuckerberg at Facebook to see examples of entrepreneurs being trusted to run big firms. But in each of those cases, the founder’s continuing control depends on the support of the other shareholders. This is not true for Sports Direct. The FTSE 100 retailer is still majority owned by its founder Mike Ashley. Technically, he’s the ‘executive deputy chairman’ rather than the CEO, but there’s little doubt who calls the shots. That’s what makes Sports Direct’s announcement that it’s cancelling a loan facility with Ashley all the more interesting. For the last couple of years, the company has kept its interest payments with the banks down by means of a £250m loan facility with its founder instead, something it said is ‘an unusual arrangement for a public company’, but which has been ‘of significant benefit to the Group, over time giving rise to a saving of over £1m’. No one really cares about the financial implications of the loan facility itself. What this really means is that Ashley wants to distance his company from himself. It’s part of a concerted effort to improve Sports Direct’s reputation after allegations of ‘work-house’ conditions at its warehouse caused the share price to lose nearly half their value since early December. Ashley clearly cares about this, which is why he said he’d personally oversee conditions at the company’s Shirebrook headquarters and make sure Sports Direct was ‘the best high street retail employer, after John Lewis’. But it won’t work. Shares in the company fell again on the news, by 2.8% to 389p – not what you’d expect if Ashley had successfully convinced people he’s distancing himself from the company. 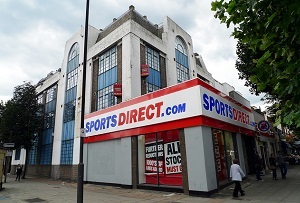 Whether rightly or wrongly, Sports Direct has a bad rep. It’s associated with harsh treatment of workers and suppliers, less-than-exemplary corporate governance (most chairmen know when one of their companies is going into liquidation before it actually happens) and some eccentric investments and joint ventures (Rangers, anyone?). Only by being scrupulous in following best practice and transparent to a fault can Sports Direct wipe that image clean. Perhaps that is theoretically possible in some respects, but not in the case of Ashley. No one will believe his influence over the company is anything less than total while he’s still the majority shareholder, regardless of whether he’s providing loans or what his title is (he could be called the deputy assistant under-intern for all the difference that would make). That means there will always be doubts about the firm’s corporate governance until he sells his stake, which is about as likely as a 50ft bronze statue of Ashley decked out as St George being unveiled at the Ibrox stadium in Glasgow. This doesn’t mean Sports Direct can’t improve its reputation, of course, but it will take more than a few gestures to do so.